In August of 1994 I became the proud Trustee of W3TKQ, and in 1995 we were able to add a state-of-the-art slow scan TV position to our fine station, thanks to donations from the manufacturers of the individual components. 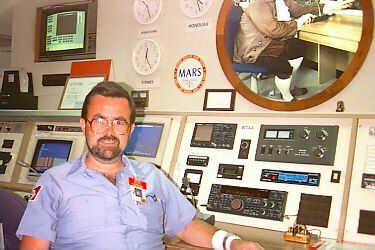 In 2000 with the help of Fred Rice WA3KIO we added PSK31 to our station. What can I do to top all this? Well, as the third trustee in the 44 year history of this station, I will try to keep the station active and up-to-date as much as possible. Since there has not been a term for a trustee under 20 years, I have a long way to go to keep up with my predecessors, and along the way I hope to have as much fun as Rollie did. By the way, he's still a very active volunteer, and comes in every Monday to help out! Please stop and visit our beautiful station when you're in the Philadelphia area. We can be reached by phone at 215-448-1139, by e-mail at w3aa@fi.edu, by packet at w3aa@w3aa.#sepa.pa.usa.noam, or when in the local area, on Phil-Mont's 147.03 repeater. Please remember to bring a copy of your license if you plan to operate the station.